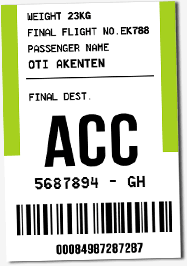 Accra Kotoka International Airport is located northeast of the historic city center of Ghana's capital, between the Burma Camp area and the airport district. The terminal is strategically located near the Tetteh Quarshie Interchange, which connects highways to Accra and to the north, east and west of Ghana. Thanks to its expressways, the airport entrance is located just 8.5km from the city center and Accra railway station, which can be reached within 30 minutes under normal traffic conditions.